While tea is rarely thought of in Southeast Asia it does exist with tea plantations often found in cooler climbs and mountainous regions bordering China in Northern Laos, Vietnam and Thailand. My most recent tea garden experience was in Chiang Rai, Northern Thailand (left image) which admittedly was not the most exciting of experiences. 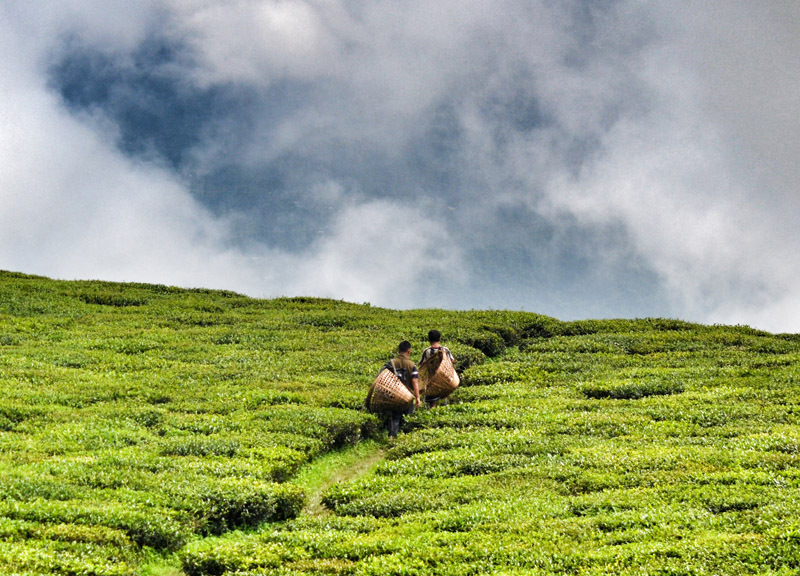 To find the better tea gardens you need to travel North into China and India to the regions famous for tea picking. On this journey we are a lot higher, travelling to heights over 7000 ft in the Indian Himalayas, plugging tea leaves in the Temi Tea Garden of Sikkim. Which, while lesser known than Assam and Darjeeling tea plantations, the scenery at the Temi Tea Garden are hard to beat, and the same goes for much of Sikkim Tourism. We stayed at the Cherry Resort which I do recommend; the Temi Tea Garden is in a remote area of Sikkim and the ‘nearby’ city of Gangtok is roughly a 3 hour drive . While Cherry Resort isn’t the most luxury of hotels the views from our balcony are hard to beat. In the morning I wake shortly after sunrise as locals descend from the horizon of nearby hills to a small village opposite the hotel. After breakfast and banter they trek again further down to start tea picking. Local women and men pluck tea leaves from 7am – 4pm daily. I regret not visiting the village but views from the balcony were hard to leave. Tea picking starts from the lower tiers and gradually climbs to the top. Large baskets are fixed to the backs of tea pickers for catching leaves thrown back over their shoulders. Hard to miss really. The tight paths between tea bushes are surprisingly slippery as I find when falling flat on my ear. They are also muddy. In the Temi Tea Garden there is always potential danger from snake bites and tea pickers have thick padding strapped to the lower legs for protection. Having just walked to meet them I was out of breath -to work 9 hours on these slopes is beyond me. Seriously impressive. 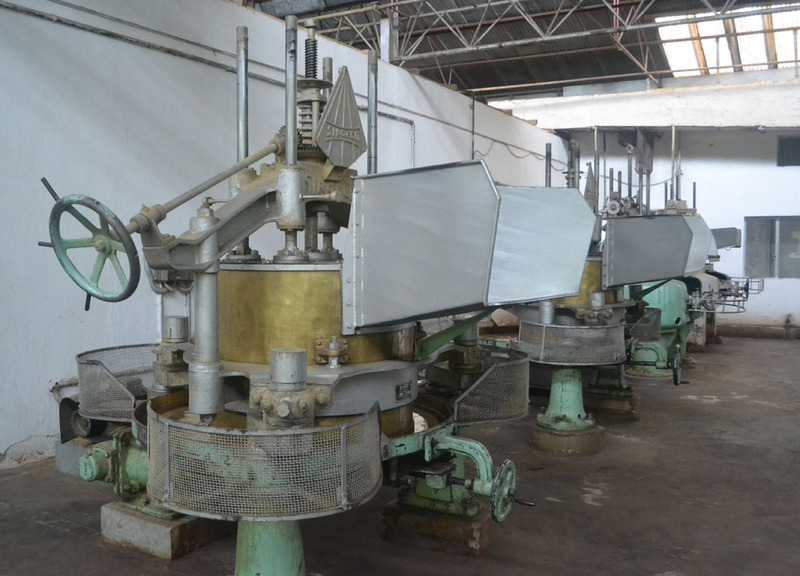 The Temi Tea Factory doesn’t do tours so I was forced to use my clout as a travel blogger to have the factory emptied and the manager show us around (it was empty for cleaning day). We are guided through rooms of drying contraptions, sorting machines and packaging processors. We learn the difference between loose leaf tea and teabags (loose leaf tea is better and more expensive). The bigger the loose leaf the better (I think). I am one of the few non-tea-drinking Brits so I was there more for the views and experience which were well worth it. If you do plan on visiting the Temi Tea Gardens it is best to stay the night.